These two are going at it again. It doesn't get as bad as it did a while back when the dominant got badly beaten up. He's still not ready to give up his status. The D. compressiceps makes his appearance as he does in every video I try to take. Sorry, this video is a little out of focus for some reason. Those Rusties are nice Betty. How big and old are they? And what's the stocklist of that tank? Nice vid B. and very nice looking Rusties. Seems like the eye-biter was looking for a snack. Does he do the same thing when your fish are mating? Cool. There's peace in the Rusty tank at my house now, a friend now has the sub-dominant male, and mine has his harem of 4 females. he's happy. The compressiceps is cool, by the way! Both males look awesome ! I wish I could find some Rusties here, but no such luck. Thanks everyone. I got these rusties back in '07. I'd estimate them at around 4 to 4 1/2 inches. The eye-biter sticks his long face into everything, but never does any harm, except the time he tried to eat a rather large fish and got it stuck in his mouth for a few days. nice video the comp is sweet. awesome video great footage the Comp(1of my favs) is just bad azz,does 1 ever win?? Thanks all. That comp is one of my favorites as well. I rescued him from cramped quarters expecting to have to give him up when he outgrew my tank, but I've had him for a long time now and he hasn't grown at all. He's colored up nicely and gained some weight, but isn't growing in length. How long is he? Maybe he was permanently stunted from wherever you rescued him from. I'd say he's about 7 inches or so and hasn't changed noticeably in size. I've had him for about a year and a half -- I think. About 1.5 yrs ago we picked up a pair of rusties and they have been breeding like crazy. 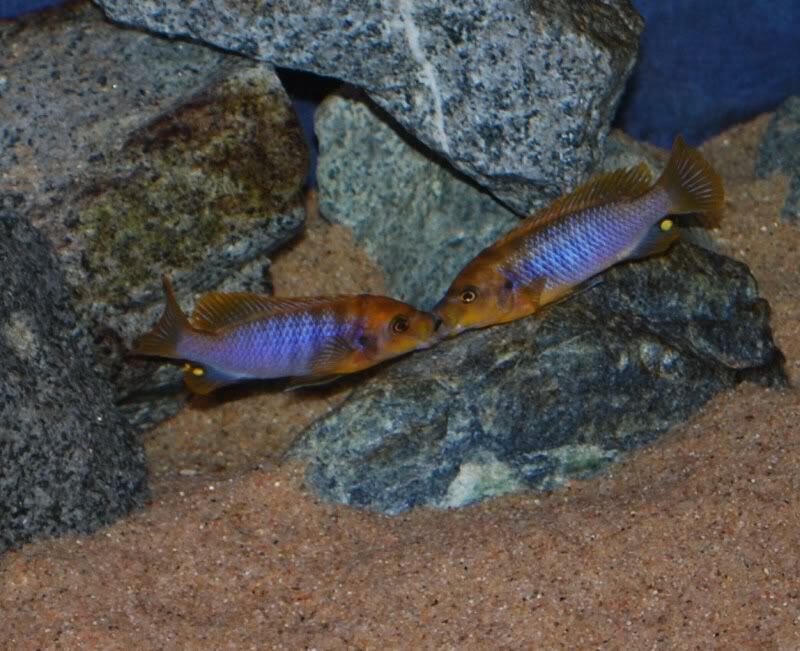 A few of their fry have been grown out and added to the show tank and, while the original male is still dominant, he has competition from one of his sons. While the fighting gets about the point of yours in the vid, we never get much damage to the lips - mostly just the white lips. Are your scarred or just torn up a bit in the video? Their lips are always some shade of white and I'm sure some of the damage is probably permanent.